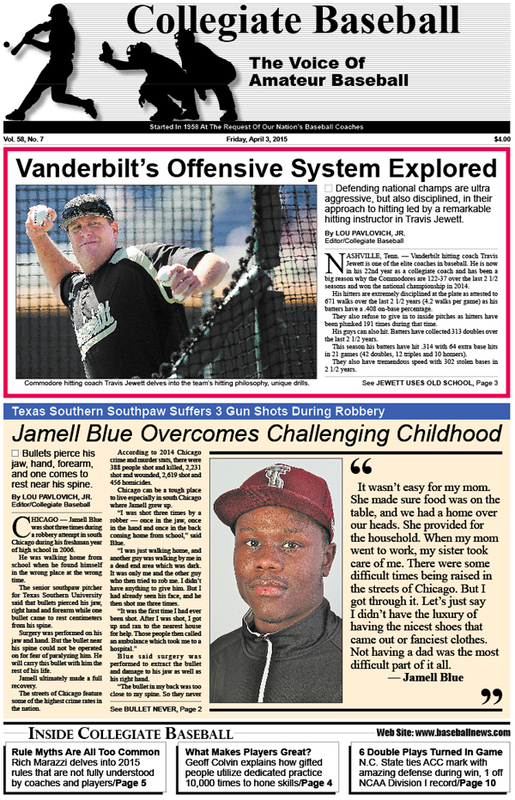 • Vanderbilt’s Offensive System Explored: Defending national champs are ultra aggressive, but also disciplined, in their approach to hitting led by a superb hitting instructor in Travis Jewett..
• Tough Childhood: Texas Southern pitcher Jamell Blue suffers 3 gun shots during robbery as one bullet comes to rest near his spine. • Honoring Ron Fraser: Former Miami, Fla. Hall of Fame skipper will have statue unveiled which honors this terrific skipper who led the Hurricanes to 2 national titles and was the greatest promoter in college baseball history. • How Great Performers Develop In Life: Geoff Colvin explains why it takes 10,000 hours of dedicated practice to perform at the highest levels. • Editorial: Lou Spry was a shining light at College World Series for 32 years, 439 games. • Ruleball With Rich Marazzi: Numerous myths, perceptions are a big part of baseball rules. • NCAA Division 2 Notes: Wilmington’s Frank Samluk strikes out 15 batters in 7-inning victory over Mercy. • NAIA Notes: LSU Shreveport wins wild 17-inning thriller, 5-4 over LSU Alexandria. • NCAA Division 1 Notes: N.C. State ties Atlantic Coast Conference record with 6 double plays in contest. • Louisville Slugger National Players Of Week: Seven players put up extraordinary numbers, including RHP Drew Rasmussen of Oregon St. who fires the first perfect game in school history. • Charlie Greene Column: Evaluating potential pro prospects is an interesting process. • Texas A&M No. 1: Aggies ranked at top of Collegiate Baseball top 30 poll presented by Big League Chew with 24 consecutive wins. • National High School Poll: JSerra Catholic No. 1 with perfect 6-0 mark in Collegiate Baseball’s National top 30 poll. • High School Notes: Second Baptist wins Aggie Classic Tournament title in Pensacola, Fla..
• NCAA Division 3 Notes: Kenyon’s Brandon Smalling 1 error away from perfect game. • 2015 College Hall Of Fame Class: Big name athletes, coaches highlight impressive list of inductees, including former Rice star Lance Berkman. • Brian Cain Column: Matt Carpenter has always been a master of the mental game and should be studied. • Junior College Notes: Western Nevada plans on eliminating baseball at end of 2016 baseball season. To purchase the April 3, 2015 edition of Collegiate Baseball, CLICK HERE.